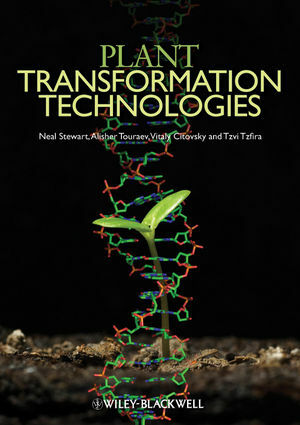 Plant Transformation Technologies is a comprehensive, authoritative book focusing on cutting-edge plant biotechnologies, offering in-depth, forward-looking information on methods for controlled and accurate genetic engineering. In response to ever-increasing pressure for precise and efficient integration of transgenes in plants, many new technologies have been developed. With complete coverage of these technologies, Plant Transformation Technologies provides valuable insight on current and future plant transformation technologies. With twenty-five chapters written by international experts on transformation technologies, the book includes new information on Agrobacterium, targeting transgenes into plant genomes, and new vectors and market systems. Including both review chapters and protocols for transformation, Plant Transformation Technologies is vitally important to graduate students, postdoctoral students, and university and industry researchers. Alisher Touraev is Group Leader and Associated Professor of the Institute of Microbiology and Genetics at Vienna University. Vitaly Citovsky is a Professor in the Department of Biochemistry and Cell Biology at the State University of New York, Stony Brook. Agrobacterium (BENOˆIT LACROIX, ADI ZALTSMAN, AND VITALY CITOVSKY). Chapter 2 Genomics of Agrobacterium–Plant Interaction: An Approach to Refine the Plant Transformation Technology (AJITH ANAND, ZARIR E. VAGHCHHIPAWALA, AND KIRANKUMAR S. MYSORE). SECTION 2 Other Transformation Technologies. Chapter 3 Particle Bombardment: An Established Weapon in the Arsenal of Plant Biotechnologists (THEODORE M. KLEIN). Chapter 4 A Novel Gene Delivery System in Plants with Calcium Alginate Micro-Beads (NAOKI WADA, SHIN’ICHIRO KAJIYAMA, NARUEMON KHEMKLADNGOEN, AND KIICHI FUKUI). Chapter 5 Pollen Transformation Technologies (TATIANA RESCH AND ALISHER TOURAEV). Chapter 6 Intragenic Vectors and Marker-Free Transformation: Tools for a Greener Biotechnology (CAIUS M. ROMMENS, ANTHONY CONNER, HUA YAN, AND ZAC HANLEY). Chapter 7 Visualizing Transgene Expression (JOHN J. FINER). SECTION 3 Vectors, Promoters, and Other Tools for Plant Transformation. Chapter 8 Current State and Perspective of Binary Vectors and Superbinary Vectors (TOSHIYUKI KOMORI AND TOSHIHIKO KOMARI). Chapter 9 Novel Dual Binary Vectors (pCLEAN) for Plant Transformation (PHILIPPE VAIN). Chapter 10 pORE Modular Vectors for Plant Transformation (DWAYNE D. HEGEDUS). Chapter 11 pANIC: A Versatile Set of Gateway-Compatible Vectors for Gene Overexpression and RNAi-Mediated Down-Regulation in Monocots (DAVID G.J. MANN, PETER R. LAFAYETTE, LAURA L. ABERCROMBIE, WAYNE A. PARROTT, AND C. NEAL STEWART, JR.). SECTION 4 Transgene Integration, Stability, Methylation, Silencing. Chapter 12 Understanding and Avoiding Transgene Silencing (MICHAEL W. GRAHAM, STEPHEN R. MUDGE, PETER R. STERNES, AND ROBERT G. BIRCH). Chapter 13 Site-Specific Recombination for Precise and “Clean” Transgene Integration in Plant Genome (VIBHA SRIVASTAVA AND DAVID W. OW). SECTION 5 Selection Systems, Marker-Free Transformation. Chapter 14 Selectable Marker Genes: Types and Interactions (BRIAN MIKI, ASHRAF ABDEEN, YUZUKI MANABE, SOUAD EL OUAKFAOUI, DOUGLAS A. JOHNSON, LORETA GUDYNAITE-SAVITCH, MING HU, AND PHIL MACDONALD). Chapter 15 Transformation Methods for Obtaining Marker-Free Genetically Modified Plants (JAN G. SCHAART, FRANS A. KRENS, ANNE-MARIE A. WOLTERS, AND RICHARD G.F. VISSER). Chapter 16 Intellectual Property Aspects of Plant Transformation (JIM M. DUNWELL). Color Plate between pages 82 and 83.